Club Penguin Cheats by Mimo777 Club Penguin Cheats by Mimo777: Club Penguin Celebrates Australia Day! Since Australia is 15 or so hours ahead of us, it is already being celebrated on the island now! Mimo? look at the herbert cam! herbert is missing! How are you supposed to be a gold penguin?? Awwh how sweet they didn't forget us :) Im really impressed. 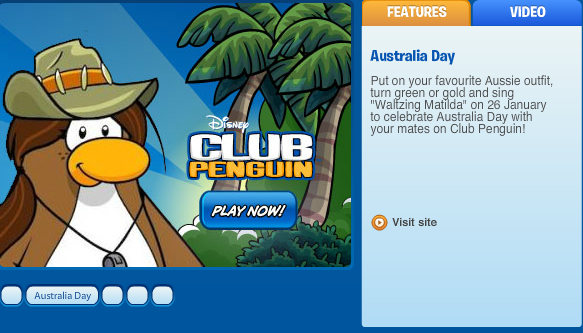 Everything is so american it is nice to see australia around on cp.